Small countries, like Bulgaria, are usually not capable to single-handedly develop and build a Main Battle Tank. However, creating an Infantry Fighting Vehicle using existing platforms is far more at hand. This is exactly what the Bulgarians intended, producing a vehicle tailored to the needs of the Bulgarian Army then under the Soviet sphere of Influence as part of the Warsaw Pact. The overall goal was to have an improved IFV compared to the BMP-1 already in service. Only a few of the resulting BMP-23s were cranked-up by KINTEX State Commercial Enterprise, some sources claiming 50 (Wikipedia), while others claiming 114 (Army-Guide). The vehicles entered service in the early 1980s. The basis for the BMP-23 was the sturdy Soviet 2S1 “Gvozdika” self-propelled howitzer, built under licence in Bulgaria at the time. The Gvozdika itself was based on the multipurpose MT-LB chassis. However, given the goals of the military, it had to be given much sturdier armor than that of the BMP-1. The better engine and reinforced suspension helped in this way. The hull was also comprehensively modified to integrate a roomy troop compartment at the rear, for six equipped infantrymen seated back-to-back. The rear was modified to accept two doors for dismounting, in addition to the two large roof hatches. Three pistol ports were also placed in the walls, with bulletproof vision devices. The welded steel hull was reinforced with a frontal arc protection of about 20-23 mm (0.8-0.9 in). It is assumed that it is able to withstand 23 mm (0.9 in) AP rounds. The turret was, of course, the major addition to this vehicle. It has a rounded rear, with flat sides all around and a well-sloped front. Protruding from the turret is a 23 mm (0.9 in) 2A14 automatic cannon. It is the same gun used in the ZU-23-2 light AA gun which equipped the Soviet light AA units. It is fed by 600 rounds, has +80° of elevation, and can fire either HE-IT and AP-IT ammunitions with a muzzle velocity of 970 m/s. This gun, introduced in the 1960s, has a total length of 4.57 m (10 ft) and a barrel length of 2 m (79.1 in), or 87.3 calibers. It fires a 23x152B round, with two rate of fire settings, one low, at 200/300 rounds/min, and one high, at 500 rds/min. The practical range is 2.5 km (2 mi). The armament is completed by a 7.62 mm (0.3 in) machine gun (PKT) coaxial light machine gun, and, in order to deal with tanks at longer ranges, a 9K11 Malyutka ATGM launcher, recently replaced with a 9K111 Fagot. The latter is an SACLOS missile, fitted with a 1.7 kg High Explosive Anti-Tank (HEAT) warhead. The Malyutka can defeat up to 400 mm of RHA /200 mm 60° sloped armor up to 2,500 m. The Fagot is claimed to be effective up to 4,000 m and has tandem HEAT rounds. The mount is electrically operated from inside, with 90° of traverse and -5 to +15° elevation. In addition, the crew carried their personal AK-47s, RPG-7V, and RPG-22, plus a Strela-2M for AA cover. For targeting, the gunner, who sat on the left, has a binocular day sight with a magnification of ×4.5 and a 40° field of view. He can use a forward-opening hatch cover and a white light searchlight. The commander, on the right, has a cupola with single-piece hatch cover opening to the front and mounting an infra-red searchlight. He also has his own 1PZ-3 monocular sight, TKN-3B day/night sight with a ×4.75/×4 day/night magnification. These sights were produced under license by the Vazov Engineering Plant in Sopot, Bulgaria. Mobility-wise, the BMP-23 is given an improved engine, the turbocharged diesel YaMZ-238N, which develops 315 hp, giving the vehicle a 62 km/h (39 mph) top speed on road and 550 to 600 km (340-370 mi) operational range on average. The drivetrain is shared with the MT-LB and Gvozdika, with a full row of seven evenly spaced rubberized road wheels without return rollers. The drive sprocket is at the front and idler at the rear. Each road wheel is suspended on a torsion bar. In addition, the first and last suspensions units came with hydraulic shock-absorbers. For concealment, the usual exhaust smoke ejector is used. However, two banks of three 81 mm electrically operated smoke dischargers were added on the modernized BMP-23D version. Importantly, the BMP-23 retains the amphibious characteristics for the MT-LB, with enough buoyancy to swim, propelled and guided by the tracks. Preparation for going into water includes raising the trim vane and removing the hull sides slotted mudguards. Fire detection and suppression systems are installed. It is also fitted with R-123M VHF radio and R-124 tank intercom and an NBC collective protection with GO-27 radiation and chemical detection system. -BMP-23D: Upgraded model with the 9K111 Fagot ATGM plus 2×3 81mm smoke grenade launchers. -BRM-23: Reconnaissance vehicle, apparently entering service in limited numbers in 1991, equipped with a large folded antenna mounted on the rear of the vehicle. -BMP-30: A prototype was built using a turret very similar to the one seen on the BMP-2. Only 10 built in 1995 according to Army-Guide. It has a 2A42 30 mm (1.18 in) autocannon with 4000 m range, coaxial PKT and AT-5 Spandrel ATGM. 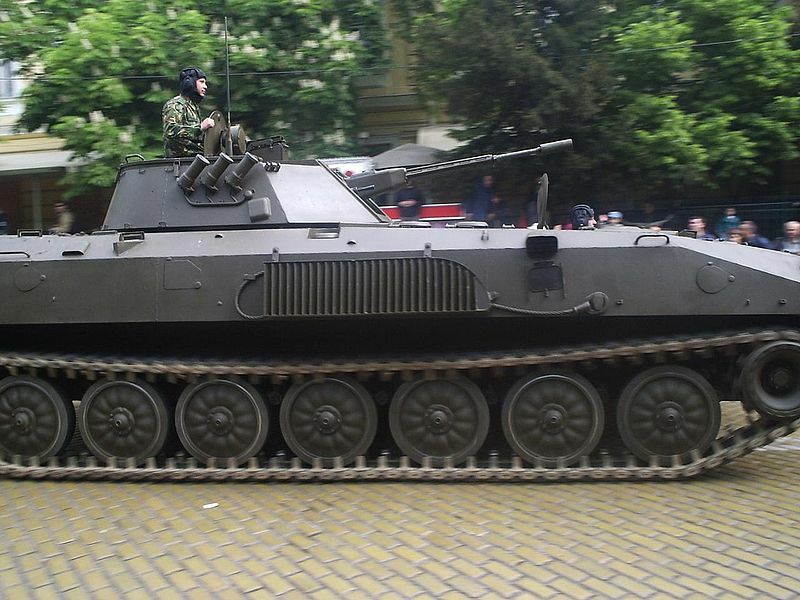 The BMP-23 was first publicly revealed at a parade in 1984. It served its tour of duty in Iraq along with the M1117 Armoured Security Vehicle, without any noticeable events taking place. 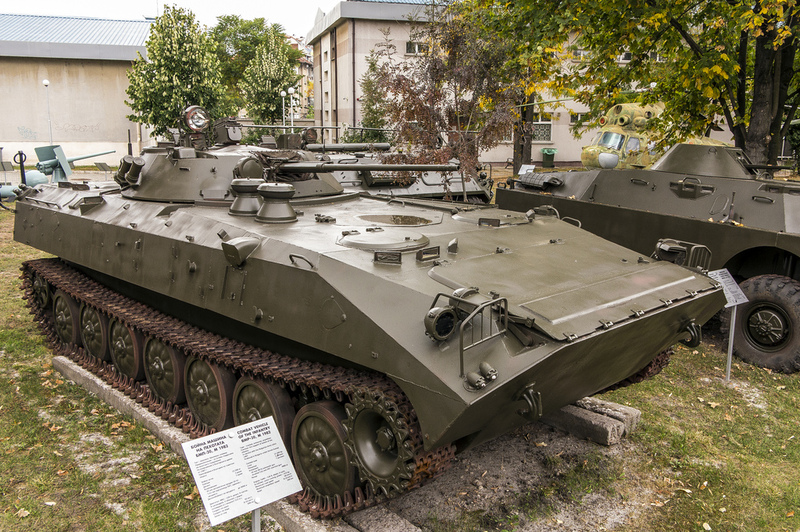 The BMP-23D is still in service today in the Bulgarian Army. There is an interesting “recycling” potential for nations willing to get rid of their old 2S1 Gvozdika SPGs and transform them into anIFV more potent than the BMP-1. 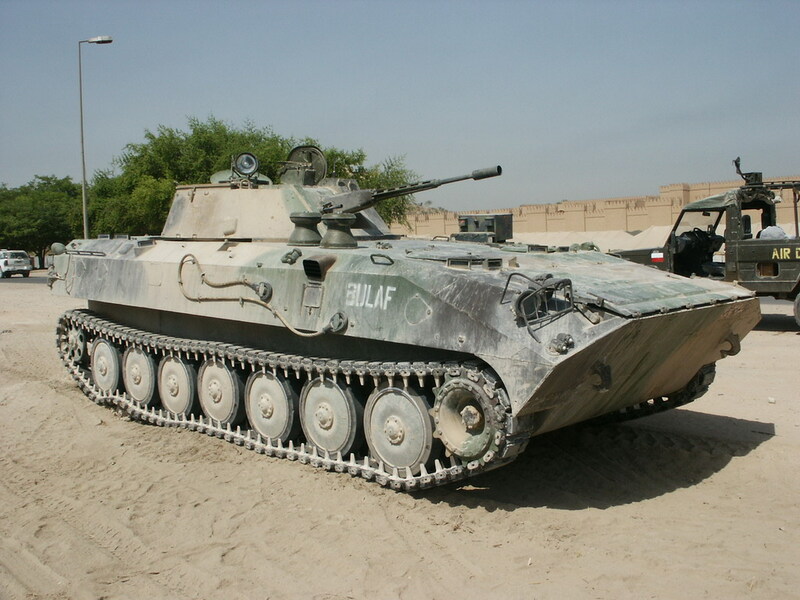 Camouflaged BMP-23D BULAF, Iraq, 2000s. Why would you replace a howitzer with an IFV?